This craft is a fit for a preschool or day care setting where it can easily be turned into a group activity. 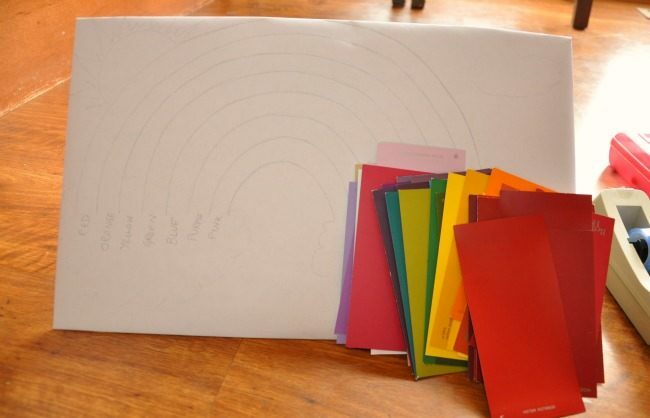 It is also a perfect fit into any rainbow themed birthday activity, which the kids can make for the birthday child as a keepsake from the party. 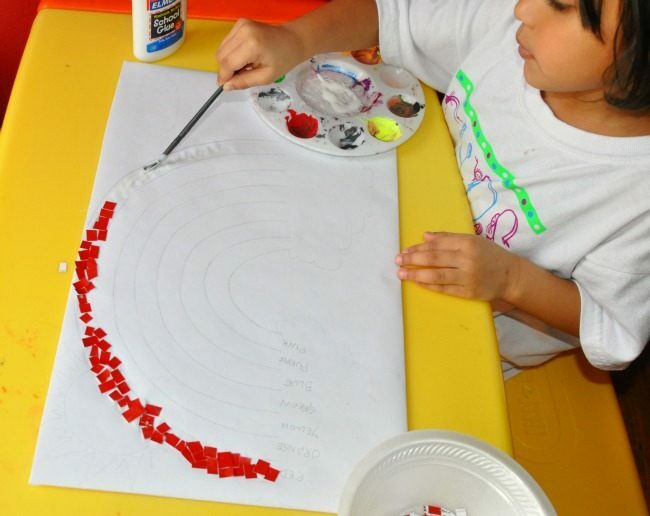 It is also a wonderful fine motor activity for kids. When I see my kid work on kids crafts like these I can personally see that it really develops patience, perseverance an a sense of accomplishment. Here’s what I did. 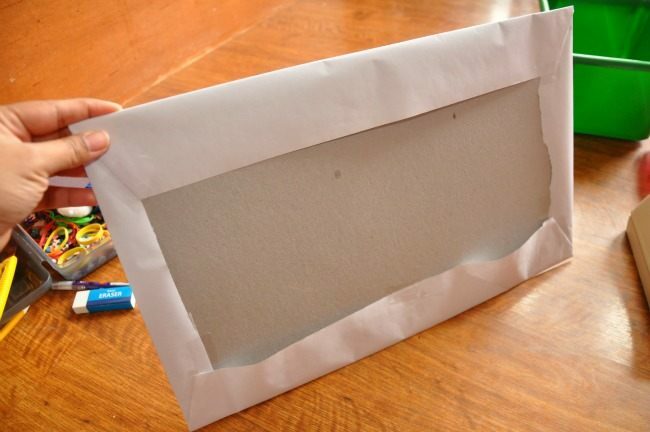 I cut the paint cards into smaller chips and covered a cardboard with a white sheet to be our canvas. I drew a rainbow outline and named the colors in the order. We spelled out the colors as we wrote them and sang our favorite rainbow song as we tried to remember the order. Beautiful Rainbow in the Sky ! 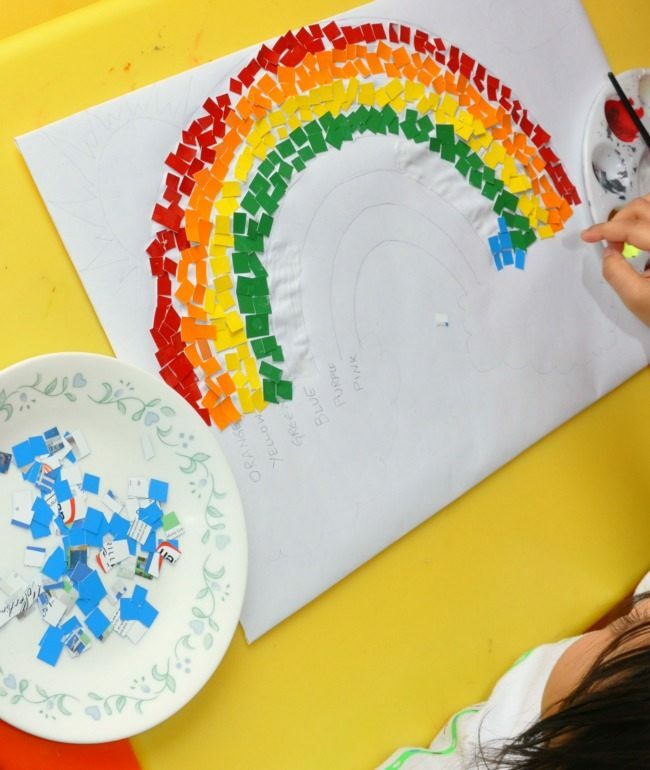 This rainbow craftwill work great as a collaborative activity in a group setting where in working on it aids in turn-taking, respecting others, communication and in general team-building. She then used the cotton balls to make clouds and even colored a cloud blue with dot markers. It was such a cute and easy rainbow craft that my 4 yr old enjoyed making and is now a display piece that shes so proud to have created. Obviously, you don’t have to finish the entire craft in one session. Let the child lead the way! 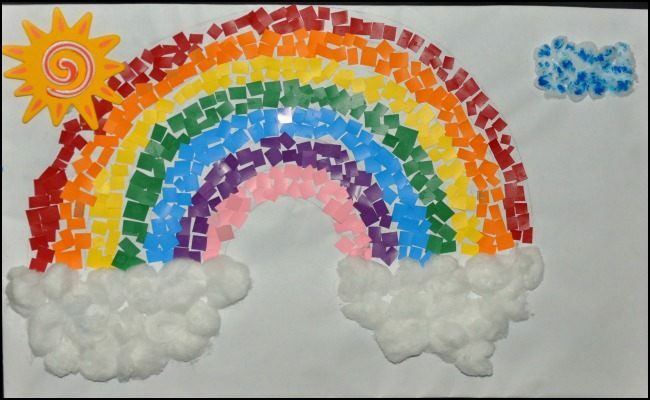 Check out out more rainbow crafts for kids on our Pinterest Boards.